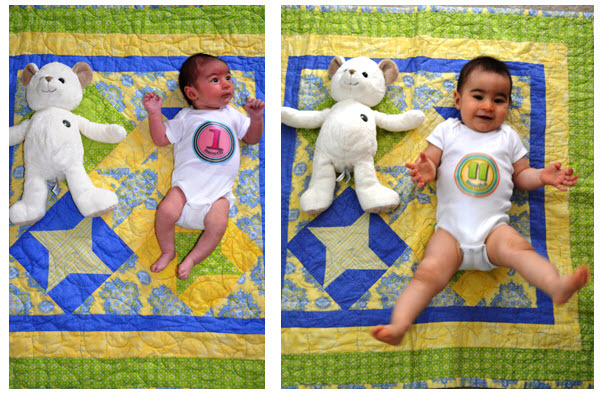 Month one and month eleven ... geez! I told you she was getting squirrelly!! I'm by no means a vegetarian, nor do I think I ever could be (except for that one Lent 11 years ago when I gave up meat) ... ut, there are many days I don't eat meat and don't miss it. I think any carnivore can agree that a burger is just better when there's a little fat involved. You need juices when you have a burger. That said, I love to find healthier alternatives to the many nights during the summer that we decide to grill out and Mike wants a burger. I love a good turkey or chicken burger, but I also love a good black bean burger and had never tried my hand at making them until a few weeks ago. I didn't realize until I was pattying them up that Mike had never tried a BBB ... (come on, did you thnk I'd leave that acronym hanging?). Gasp. Seriously?? As he stood there and watched the process I was saying a silent prayer that these turn out successfully. Place 2½ cups of the beans in a large bowl and mash with a potato masher or a fork until mostly smooth. In a separate bowl, combine the eggs, 1 tablespoon of the oil, cumin, salt and cayenne. Whisk to blend. Add the egg mixture, toasted panko, the remaining ½ cup beans, bell pepper, cilantro and shallot to the bowl with the mashed beans. Stir together until evenly combined. Divide the mixture into 6 equal portions, about ½ cup each. Lightly pack into 1-inch thick patties. (At this point the patties can be covered tightly with plastic wrap and refrigerated for up to 24 hours before cooking.) Heat the oil in a large skillet over medium heat until shimmering. Carefully lay half of the patties in the skillet and cook until well browned on both sides, about 8-10 minutes total. Transfer the cooked burgers to a plate, tent with foil, and repeat with the remaining oil and bean patties. Serve warm. I'm pretty sure you didn't grow up in America if your Mom didn't make stuffed peppers when you were a kid, so this is a recipe I was anxious to try in my slow cooker. I've been trying to use my slow cooker once a week to ease the burden of weeknight chaos, it sure is nice to have a hot meal ready when you walk in the door. As an added bonus, I love a good "one dish, one plate wonder" where you get veggies, protein and carbs in one neat little package, and this fits the bill on all accounts. I must have read this recipe (in the companion book to the blog) four times to make sure I didn't need to pre-cook the meat, but alas, I didn't, and the peppers were DE-lish! You could easily make and refrigerate the filling the night before, or assemble the entire dish and store your stoneware in the fridge until morning ... and of course, you can adjust to add your taste in spices, flavoring, etc. Happy crockin'!! Wash and trim your peppers, removing the inner seeds and membranes, and saving the tops of the peppers. In a bowl, mix the ground beef, rice and seasoning. Stuff each pepper with a good amount of the ground beef and rice mixture. 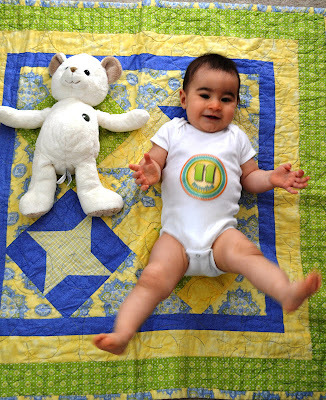 Wow, you’re only a month away from being one year old! SERIOUSLY, where did the time go over the past 11 months? I can’t believe that this time next month you’ll be able to really use that pointer finger to share with the masses that you are a YEAR old!! Well, just as soon as you started crawling and perching on your knees last month, you decided it was time to also start pulling up on couches, coffee tables, anything you can get your hands on, literally. You haven’t figured out that you can hold on and move from that position just yet, but I can see the wheels turning in your head. You can hold on to your dinosaur walker, but usually just bounce to the music, no steps just yet. You’ve also started pulling up in your pack-n-play while Mom and Dad finish getting ready in the morning and love to bounce. You’re SO deliberate and cautious in every move you make, meaning we rarely have falls or accidents. 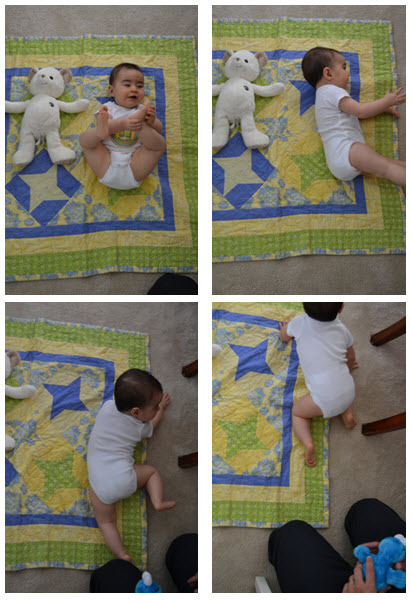 If you want a toy after you’ve been standing, you keep one hand anchored and ever-so-slowly move to your knees, assess the situation and decide if it’s back to standing, or back to your knees. Your teachers tell me that they’ll observed you watching what your friends at school are doing for a few days while they struggle to get it just right, and then one day later you’ll do the same yourself perfectly the first time. You went on a little bit of a food strike this month, I’m not sure if you were thinking you were ready for table food full-time or if you didn’t like the baby food that was offered. You got over it quickly and now we’re about 50/50 at meals with table food and baby food. You love breads (oatmeal, banana), fruit bites of all kinds, peas, carrots, green beans, mac ‘n’ cheese, and your new fave is roasted sweet potato bites; you literally start squealing as I put them on your tray. Your Dad has commented on what a piggy you can be when feeding yourself something you love, you’re known to shove 3-4 bites in your mouth at once, chipmunk-style, and/or will have another bite on your lip as you finish what you’re chewing. I keep reminding him that you know how to eat from watching him : ) I know they say that it’s too early to tell which hand you’ll favor, but your go-to feeding hand is that leftie. Time will tell, but I’m wondering if you may be the creative one in the family with the right-brain mentality. You’re hit or miss with a sippy cup filled with water. You know how to do it, but prefer to have one of us hold it for you, or better yet, use it as a chew toy. Your sweet and gentle personality continues to shine through. At school you have been regularly showing empathy to your friends when they are upset or crying by patting their arms or back or offering a kiss. You are always willing to share your toys and are now starting to share your table food with your Dad and me. I don’t know if we’re doing something right, if you’re just a gentle soul by nature, or if it’s a combination; but I love your caring, kind and gentle-natured personality. You also love attention and can really turn on the charm when there’s an audience. You love to wave these day and although it’s more of an arm-flailing exercise at this point, I’m sure it will be of Miss America standards any day. We were in Pittsburgh over Easter weekend and as we left a restaurant there were people waiting on either side of the exit walkway; you took this to mean they were lining up to see the “Anna show” and turned on the charm; there was double hand-waving, laughing, giggling, and coy smiles going all around. You were in heaven! You’ve also recently found your shadow when crawling around the house on a sunny afternoon and will start to put on a show for your new friend until something else, usually one of the cats, catches your attention. Last but not least, you were privy to witnessing a historic event this past month when UK won their eighth National Basketball Championship. This is the third championship I’ve witnessed in my lifetime, and what I hope will be the first of many in yours. We decided to let you stay awake for the Final Four game versus Louisville, and you tried gallantly, but started to get sleepy just as the game was in its final minutes. So, we went to your Uncle Michael’s man-cave (for privacy while nursing and also a quiet space) where you fell asleep before we were able to declare victory. As the game ended, your Gigi and I silently cheered and high-fived, being quiet enough not to wake you. Two days later, I had an afternoon Diet Coke and had to hype myself up after you went to bed to ensure I stayed awake for the entire game. I cannot begin to tell you how different a celebration this was versus 14 years ago when UK won their last title and I was a freshman in College. I can also tell you that 14 years ago I had no idea what true happiness meant, or what it felt like to love someone completely and unconditionally, or how amazing it feels to see the sweetest smile in the world each day after work. You’ve truly been a life-changer for me, and in the best possible way. I can’t imagine anything I’d rather be doing with my days. Mommy Moments: The highlight reel or behind the scenes? I realized over the weekend that Anna's birthday is next month, about 4 weeks away, and other than sending out a "save the date" e-mail to our family, I haven't done a single thing related to the party. Sure, I have high-level ideas, like there will be cake (ha! ), but nothing concrete. I haven't even ordered invitations, much less thought through a menu, favors, decorations... Work has been insane and we've been out of town four of the past six weekends on top of just living life. I keep telling myself that I need to find a balance between wanting to be Super Woman and just existing, but it's HARD. Lately I've found balance is about as easy to track down as a pot of gold or a winning lottery ticket. I want to give 110% at everything I do, that's how I operate, it's my nature. Being a Mom, being a wife, being a daughter and daughter-in-law, being an employee, being a friend, being a follower of God. I don't want to drop any of the balls I'm juggling, and what I'm realizing that I'm probably always going to disappoint someone. BUT, more importantly, I'm realizing that the "someone" disappointed is ME. 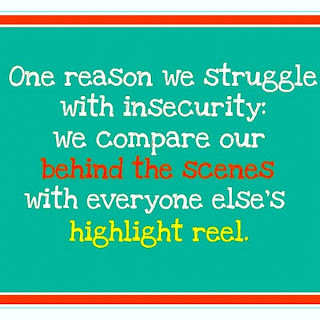 I find myself living in a state of comparison and continuing to set a goals of being Super Woman. I've finally come to a realization that I can keep going down this path and run myself ragged, OR I can try to lower the bar and find perspective in my day-to-day routine. Am I ever going to get it totally right? Heck no! But, does anyone, really? Helping me get to this place were a few articles I read over the past few days. A couple had me shedding tears (of joy and relief) and were put before me just when I needed to be lifted up the most; they added the perfect amount of perspective to my day. Check out Amy's blog post here and then take a gander at this article by April and make sure you check this out too. In our age of blogs and social media and texting and video chatting, it's easy to see snapshots of the lives of others and think they have it all figured out. That you're missing a piece of the puzzle everyone else just clicked into place. Maybe some people think that about me, who knows. And if you do, then come on over to my house any night of the week to see what a chicken running around with her head cut off looks like. I'm here to tell you I don't. No one does. I'd like to think that most people go to bed at night thinking there's more they should have or could have crammed into their day; because I certainly do. But now instead of dwelling on that aspect alone, I'll remind myself that they don't have the best husband in the world, the best Mom in the world, the cutest and sweetest and snuggliest baby in the world, a job with the flexibility and so many other great perks, two cats that are rotten as a composte pile but give the best buddy bumps, neighbors that look out for each other and gather in the evenings after work, a great network of friends ... I could go on and on. So, now when I start to fret that Anna may not have a perfectly themed first birthday party, or that there are toys all over every corner of my house, or that I'm behind on the laundry ... I'll try to take a step back, take a deep breath and realize it's because I chose, that day, to focus on what really matters. 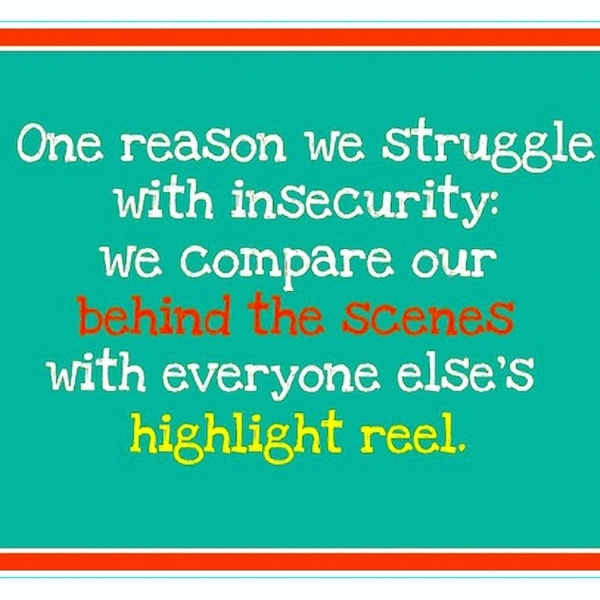 I'll stop fretting about the behind the scenes and focus on the highlight reel that is my life. And it's a pretty awesome highlight reel, if I do say so myself! It's not always cute pictures and perfect smiles around our house. Sometimes we wear our shirts around our necks and lounge around in our diaper all afternoon. It's wedding season for the Millers! I'll be gaining a sister in just a little over a month and I couldn't be more thrilled! Although I miss planning my own wedding and have been living vicariously through the bride and groom-to-be's diligent attention to detail, I'm loving that my role this time around is simply that of a party planner. Thanks so the Greentree Tearoom (you MUST visit here if you haven't), my friend Amber's wonderful inspiration, Martha Stewart's crafty ideas, and a little work of my own, my Mom and I hosted an elegant shower on a beautiful day in Lexington last weekend. Next up, one rip roarin' good time at the bachelorette party and then the big walk down the aisle on May 19! The hot brownette, one of several courses of utter deliciousness! We recently brought out Anna's "Stride to Ride Dino" and it's been a huge hit. It took her a few "rides" to realize she needed to hold on (for the most part) to the handle bars, but now she's an old pro and loves her evening rides around the house and is starting to "cruise" along as well.